Tag Heuer watches present a fusion of beauty and technology. There are fashionable and architectural, seamlessly blending art and design. The brand, created in 1860, brings more than 150 years of experience to the table. Throughout the decades they have crafted irresistible timepieces for men and women, including men’s, women’s and novelty collections that are endorsed by brand ambassadors from the worlds of sports and entertainment. Be sure to check out models that include the Connected, Carrera, Formula 1, Aquaracer, Monaco, and Link. Tag Heuer is a Swiss watch-making company that leads in precision and performance…and won’t crack under pressure! + What is the difference between quartz and automatic movements, both of which run Tag Heuer models? - What is the difference between quartz and automatic movements, both of which run Tag Heuer models? Quartz movements are powered by a battery with a quartz crystal regulator. A mechanical watch movement is wound by the action of the wearer’s wrist. While less precise (by a few minutes per month) than a quartz movement, an auto movement is the ultimate example of Swiss watch-making tradition and expertise. + What is a chronograph? - What is a chronograph? Chronograph watches are fitted with an additional function which can be used by operating the start/stop/reset pushers to measure periods of time; continuous or interrupted. + Are the diamonds in Tag Heuer watches conflict-free? - Are the diamonds in Tag Heuer watches conflict-free? Tag Heuer has signed a charter ensuring that the diamonds used in timepieces are sourced responsibly from conflict-free zones. + Can I wear my Tag Heuer watch in the water? - Can I wear my Tag Heuer watch in the water? The water activities that may be appropriate for your Tag Heuer timepiece depends on its water resistance. Generally speaking watches with water resistance of 30m/100 ft. can withstand splashes; 50m/165 ft. can handle splashes and surface water sports; 100m/330 ft. can hold up to splashes, surface water sports and waterskiing, snorkeling and scuba diving. Water resistance greater than 200m/660 ft. can survive the aforementioned plus deep-sea diving. + Can I wear my Tag Heuer watch playing sports? 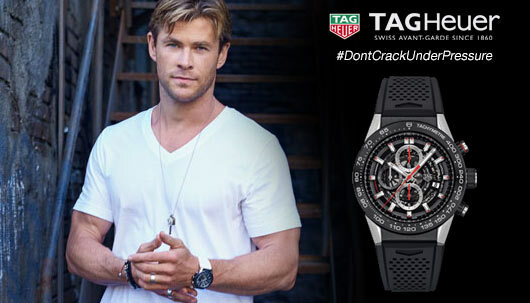 - Can I wear my Tag Heuer watch playing sports? While all Tag Heuer watches were designed for intensive wear and tested for impact resistance, whether or not you wear your timepiece for the recreational activity of your choice depends on the model. There are watches that have been built specifically for golf, marine sports and outdoor activities among the brand’s collections. + When is the best time to change the date on my Tag Heuer watch? - When is the best time to change the date on my Tag Heuer watch? You should avoid changing the date on your Tag Heuer watch between 8:00 p.m. and 4:00 a.m.
+ How can I keep my Tag Heuer watch in perfect working order? - How can I keep my Tag Heuer watch in perfect working order? There are a number of things you should keep your Tag Heuer watch away from to keep it in perfect working order, including shocks, magnetic fields, and leaving the timepiece close to speaker, refrigerators, mobile phones or magnets. It is recommended that your watch when going through an airport. Extreme temperatures, strong sunshine, chemical products, including solvents, detergents, cosmetics, sand and water should also be avoided. Also, it is recommended that you verify your watch’s water-resistance with an official service center of Tag Heuer annually; make sure that the crown is fully pushed in against the case; rinse the watch in fresh water and dry it after it is exposed to salt water; and only wear a watch with a metal bracelet or rubber strap in water, which can discolor or deform leather materials. + What should I do with my Tag Heuer watch when I am not wearing it? - What should I do with my Tag Heuer watch when I am not wearing it? If you are not regularly wearing your automatic Tag Heuer watch, you should wind the mainspring manually, using the crown unscrewed or in neutral position, or purchasing an automatic watch winder. You should remove old, inoperative batteries from a quartz watch. Additionally, you can should clean your timepiece every two to three months with a dry soft brush, carry out maintenance every year or two to ensure the water-resistance of your watch, consisting of preliminary operations, case and bracelet operations, movement maintenance, and quality control operations; and have a complete overhaul done every four to six years. + How do I know that my Tag Heuer watch is authentic? - How do I know that my Tag Heuer watch is authentic? You should only buy a Tag Heuer watch from an authorized retailer for the brand, like J.R. Dunn Jewelers, whether in-store or online. + Does Tag Heuer warranty their timepieces? - Does Tag Heuer warranty their timepieces? - Watches sent for repair must be accompanied by an International Guarantee card, complete with approved signature and date of purchase from an approved Tag Heuer retailer or dedicated boutique. - The serial number engraved on the case must be perfectly legible. - Bracelets, crystals and batters, or any deterioration of the case or movement due to humidity that has entered the watch as a result of improper handling is not covered.